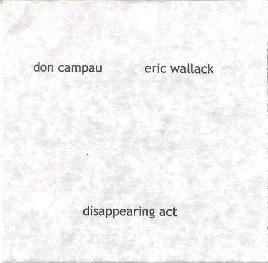 Don Campau / Eric Wallack - "Disappearing Act"
For their second collaboration, Eric Wallack composed and recorded the backing tracks and sent them to Don Campau who wrote and sang the lyrics (plus added some instrumentation). Greg Gray plays drums on 6 of the 8 tracks. The promo sheet notes that Don describes the album as "falling somewhere between a musical and Lou Reed's ‘Magic And Loss'". To my ears the music is a blend of hard rock, prog rock, and bits of 70's jazz rock. "Possess Her" opens the set and is a mellow but nicely grungy rock song with tasty guitar from Eric. "Salt Of The Earth" is similar but heavier rockin and includes more tasty guitar bits. "Minority Rule" is a standout track with a Zappa-like sense of theater and humor. "Emerald Forest" is a dirty rocker that's somewhat jazzy and a little proggy. The keyboards especially give it a 70's jazz-rock feel, which sounds nice combined with the potent guitar attack. "Mr. Hyde", "Wrong Turn" and "Deep River" are among my favorite tracks of the set, sounding like Van Der Graaf Generator, complete with Peter Hammill styled vocals. "Mr. Hyde" and "Deep River" each have a kind of a hard prog rock feel and are very intense, while "Wrong Turn" is similar but with more varied instrumentation and instrumental passages. Finally, "Disappearing Act" closes the set on a peaceful note with expressive vocals from Don. A very cool set of songs and it's great to hear Eric rocking out. I'd love to hear more stuff like this from these guys. For more info on these and other Don Campau releases, plus loads of other cool indie sounds, check out the Lonely Whistle Music catalog web site at: http://lonelywhistle.tripod.com/lwcatalog. Email Don Campus at campaudj@jps.net and Eric Wallack at ewallack@woh.rr.com.